Alex Prunty Racing: ALEX PRUNTY GETS WIN FOR MOM IN THE ALAN KULWICKI MEMORIAL! ALEX PRUNTY GETS WIN FOR MOM IN THE ALAN KULWICKI MEMORIAL! 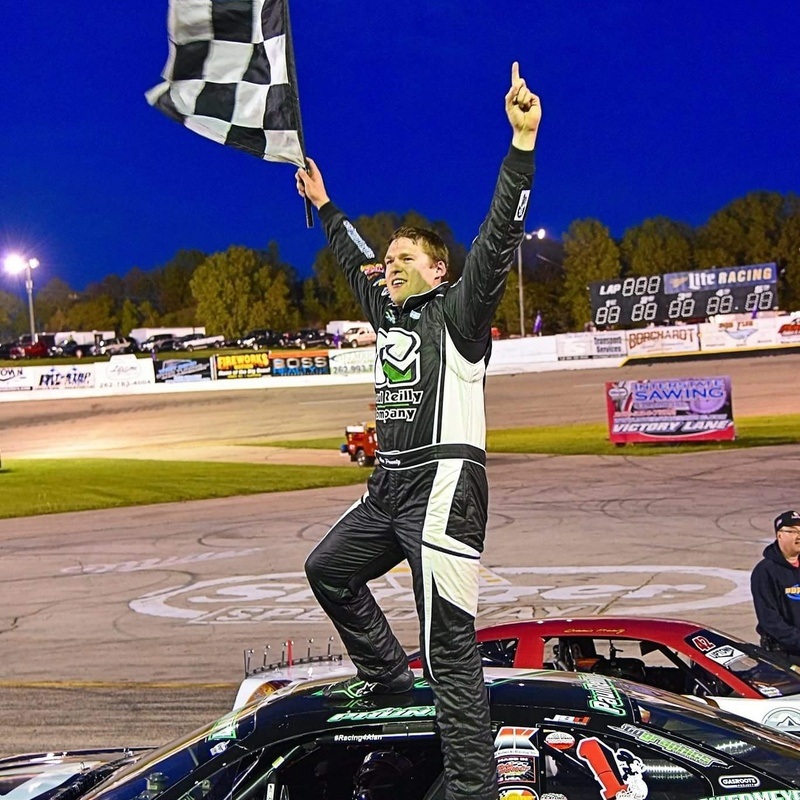 Slinger, Wis., May 20—Just prior to the start of the Slinger Speedway racing season, Alex Prunty’s mother suffered a brain aneurysm and Sunday night was the first time she was at the track since being released from the hospital. 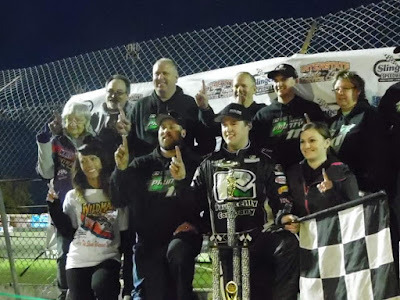 It made for an emotional night as Prunty won his first super late model feature of the year and added his name to the prestigious list of winners of the Alan Kulwicki Memorial. Prunty took the lead from defending Kulwicki Memorial winner Conrad Morgan just after a restart on lap 27 and then had to hold off numerous challenges from Dennis Prunty who had won the first two super late model features and was undefeated at the track in 2018. Pole-sitter Tim Lampman paced the first two laps before Conrad Morgan took command from the outside on lap three, bringing Alex Prunty along with him into second. Chris Blawat and Gary LaMonte also made their way by Lampman to move into third and fourth and a few laps later, Dennis Prunty and Steve Apel joined them as Morgan continued to lead over Alex Prunty. The running order behind the top two shuffled as first Apel nudged Lamonte for position in turn four and a lap later, Dennis Prunty used a similar move to get by Blawat and when everything sorted out, Prunty had third ahead of Apel, LaMonte, and Blawat. The first and only caution flag of the event occurred on lap 26 for a tangle between Rich Loch and Tim Lampman in turn four which allowed the rest of the field to close in on Morgan and Alex Prunty. Morgan chose the inside lane for the restart, leaving Alex Prunty the outer groove which proved beneficial as Prunty charged from the top side as racing resumed, completing the pass for the lead the next lap around. The outside lane became the preferred place to be as Dennis Prunty, Apel, LaMonte, and Brad Mueller all used it to advance forward. In the final laps, Dennis Prunty ran down Alex Prunty and made several attempts to pass on the inside but each time was denied as Alex Prunty was able to power off the turns to maintain the lead. With eight laps to go, Dennis Prunty tried an inside move once again but his car washed loose in turn two and as he regained control, Alex Prunty scooted away with the lead. Alex Prunty could not be caught from there and he drove to his first super late model feature victory of the season, leaving Dennis Prunty to settle for second while Steve Apel took the checkered flag in third. Gary LaMonte finished fourth and Brad Mueller was fifth. Conrad Morgan crossed the line in sixth followed by Chris Blawat and Ryan DeStefano in seventh and eighth respectively while Grant Griesbach and Brad Keith rounded out the top ten. Super late model heat races were won by Rich Loch and Alex Prunty while Gary LaMonte was the fastest qualifier after touring the speedway in 11.243 seconds.